Watford have gone level on points with second-placed Norwich in the Championship after a comprehensive win over 10-man Nottingham Forest. Odion Ighalo's fourth-minute header and a Matthew Connolly strike put Watford in charge before Forest's Kelvin Wilson was sent off for tangling with Ighalo. Gary Gardner's free-kick gave the 10 men hope of getting back into the game. But Almen Abdi's low drive made sure of the win for the Hornets, who are now third only on goal difference. After wins for Bournemouth, Norwich and Middlesbrough on Tuesday, Watford knew a victory was important to keep them in the hunt for automatic promotion. A 3-0 win would have taken them above the Canaries into second but they remain well placed and have now sealed a play-off spot at least off the back of a third successive win before their remaining fixtures against Birmingham (h), Brighton (a) and Sheffield Wednesday (h). Odion Ighalo has scored 16 league goals in 2015, two more than any other player in the top-four tiers (Tottenham's Harry Kane is second with 14). Hornets boss Slavisa Jokanovic made the decision to drop Matej Vydra, who has scored six goals in his last nine games, in favour of Ighalo and was quickly rewarded as the striker rose highest at the far post to nod in Abdi's corner for his 20th of the season. After Abdi had squandered a superb chance by prodding wide with just keeper Karl Darlow to beat, Connolly doubled the advantage by turning in from close range after Ighalo's shot had been saved. Forest's hopes of a comeback were hit just before the hour mark when Wilson was shown a straight red card for aiming a kick at Ighalo after tangling with the striker near the halfway line. However, despite being a man down, the hosts gave themselves a lifeline through on-loan Aston Villa midfielder Gardner, who fired home a superb free-kick after Eric Lichaj had been fouled on the edge of the box. 2014-15 is likely to see the highest points tally by a fourth-placed Championship team since Charlton finished on 88 in 1997-98. Forest came agonisingly close to an equaliser when Antonio somehow toe-poked wide from six yards out with the goal at his mercy following Heurelho Gomes' save from Gardner. 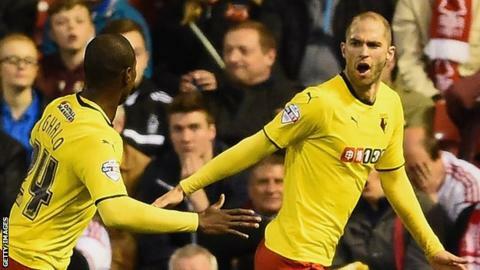 Watford took advantage of the costly miss to wrap up the points at the death when Abdi fired home after Adlene Guedioura's effort was parried by Darlow. Watford boss Slavisa Jokanovic: "I have to be happy and it was a big three points and a very important step for us. We scored a quick goal, which was vital and then we played with confidence. "There was a 20-minute period in the second half when we didn't do what we wanted to do, but we eventually got the ball back and scored a third goal." "We arrived here under pressure after last night's results. Forest are a tough team and this stadium is not the easiest to play in and it was a good step for us to come through." Nottingham Forest manager Dougie Freedman: "I am very disappointed with the result, but the spirit and commitment could not be faulted. "Their goalkeeper was man of the match and all in all, if the game was based on chances, we would have won. "We upped our game, didn't lie down and had a right go at them. I think they were proud to wear the jersey tonight. The difference was what we did in our box and they were a bit more ruthless than us. I think the crowd appreciated the effort as well. "I have no complaints on the sending off, although the players seemed to think there was an injustice at the time." Match ends, Nottingham Forest 1, Watford 3. Second Half ends, Nottingham Forest 1, Watford 3. Attempt missed. Almen Abdi (Watford) right footed shot from outside the box is high and wide to the right. Assisted by Ben Watson. Substitution, Nottingham Forest. Modou Barrow replaces Michail Antonio. Attempt missed. Gary Gardner (Nottingham Forest) right footed shot from more than 35 yards is too high. Assisted by Henri Lansbury. Goal! Nottingham Forest 1, Watford 3. Almen Abdi (Watford) right footed shot from outside the box to the bottom left corner. Attempt saved. Adlène Guédioura (Watford) right footed shot from outside the box is saved in the centre of the goal. Assisted by Daniel Tözsér. Substitution, Nottingham Forest. Henri Lansbury replaces Ben Osborn. Attempt missed. Michail Antonio (Nottingham Forest) left footed shot from the left side of the six yard box misses to the right. Attempt saved. Gary Gardner (Nottingham Forest) right footed shot from outside the box is saved in the bottom left corner. Assisted by Ben Osborn. Attempt blocked. Michail Antonio (Nottingham Forest) right footed shot from outside the box is blocked. Assisted by Todd Kane. Attempt saved. Troy Deeney (Watford) right footed shot from the centre of the box is saved in the centre of the goal. Assisted by Odion Ighalo. Attempt saved. Odion Ighalo (Watford) left footed shot from the left side of the box is saved in the bottom left corner. Assisted by Ben Watson. Attempt missed. Gary Gardner (Nottingham Forest) right footed shot from the centre of the box is high and wide to the right. Corner, Watford. Conceded by Eric Lichaj. Adlène Guédioura (Watford) wins a free kick in the attacking half. Attempt blocked. Almen Abdi (Watford) right footed shot from outside the box is blocked. Assisted by Odion Ighalo. Attempt missed. Gabriele Angella (Watford) header from the centre of the box misses to the left. Assisted by Odion Ighalo with a cross following a corner. Corner, Watford. Conceded by Michael Mancienne. Attempt blocked. Tommy Hoban (Watford) right footed shot from the left side of the box is blocked. Assisted by Ben Watson. Substitution, Watford. Daniel Tözsér replaces Ikechi Anya. Goal! Nottingham Forest 1, Watford 2. Gary Gardner (Nottingham Forest) from a free kick with a right footed shot to the high centre of the goal. Substitution, Watford. Juan Carlos Paredes replaces Marco Motta. Marco Motta (Watford) is shown the yellow card for a bad foul. Foul by Marco Motta (Watford). Attempt missed. Tyler Walker (Nottingham Forest) right footed shot from outside the box misses to the right. Assisted by Ben Osborn. Attempt saved. Tyler Walker (Nottingham Forest) header from the centre of the box is saved in the top right corner. Assisted by Todd Kane with a cross.